The upsetting test is a testing method to find out surface defects. A test specimen with predefined length becomes upset in longitudinal direction with a ratio from 1:2 , 1:3 or 1:4. 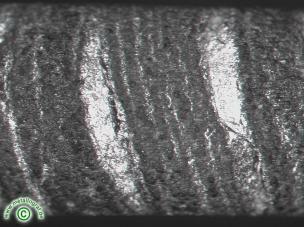 It is a indication on a possible surface defect if the surface bursts in longitudinal direction. With the appearance of the upsetting sample an experienced tester can already draw conclusions on the defect type. More exact results, under other also with regard on the defect depth, are found out in the transverse microsection.